The bus kept going higher and higher into the rolling mountains. 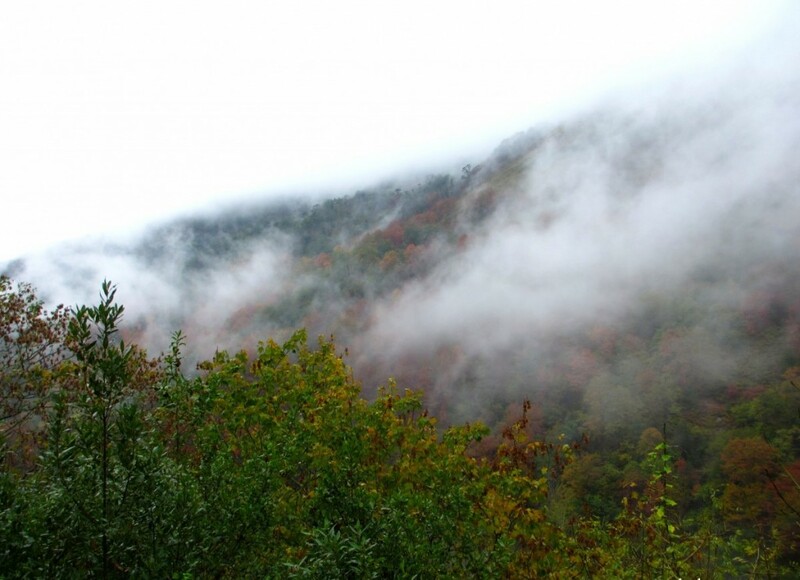 It was so misty, I couldn’t even see three feet past the side of the road, let alone the top of the mountain. Every time we rounded the corner, I thought we were nearly there. But I was mistaken; there was still a long way to go. Finally, it appeared – a few old houses and a bridge seemingly floating in the mist. Before I went to Asturias, the mist was the #1 thing people told me about. Well, okay, some of my more party-happy friends told me about the sidra first! But everyone was sure that the mist in Asturias was somehow…different. My first stop in Asturias was Gijón, where it was sunny and even warmer than it had been in Barcelona. “Psh, so much for the mist! Maybe I should have left my coat at home.” But sure enough, when I got to Oviedo that evening there was a definite dampness in the air, and the street lamps glowed softly in the fog. The next morning, I looked out my hotel window to see miles of green, rolling hills halfway hidden behind light grey clouds. And when my bus started going up those hills, I began to understand what people had been talking about. 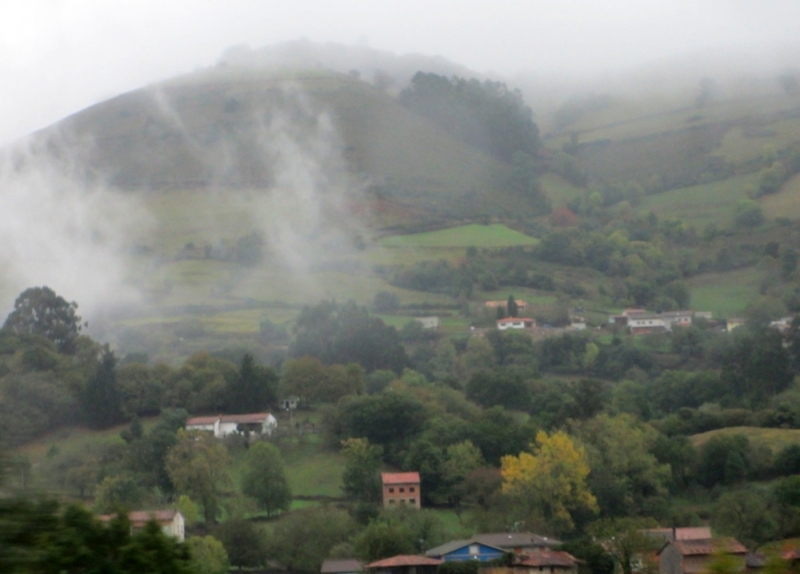 The hills looked exactly like the Leche Asturiana boxes, only they were covered in layers of clouds and mist. The clouds nearly came down to the ground level, they were so low. When we went further up the winding mountain roads, it got mistier and mistier, until we finally arrived in a tiny village nestled up against some serious hills – Covadonga. It’s home to a stunning waterfall that towers over your head. At the very top of some rocky, slippery steps is a tiny sanctuary built into the rock face. I braced myself on the not-very-reassuring barrier and looked down at the pools of water beneath it. The stony sanctuary tunnels were about as wide as a medium-sized one-way street, so even though they were dimly lit by candles they didn’t feel cramped. At a few points along the way, there were small openings that looked out onto the hillside and our next destination: the Basilica de Santa María. It’s a beautiful big church perched high on the hillside. Hundreds of years earlier, there was a temple there which was destroyed by a fire. They replaced it with this massive sanctuary with its two pointed towers. The mist was so thick it hid parts of the building, though the red-tinged stones stood out against the grey skies. The interior was also hidden, but this time by thin spirals of smoke coming from candles near the front of the church. I had to leave because the scented smoke stung my eyes and made them water. As we walked back through the tunnels and down the hillside, the church slowly started disappearing back into the mist. But before we left, I caught one last glimpse of it from the bus, floating high above us in the middle of a ring of mountains. 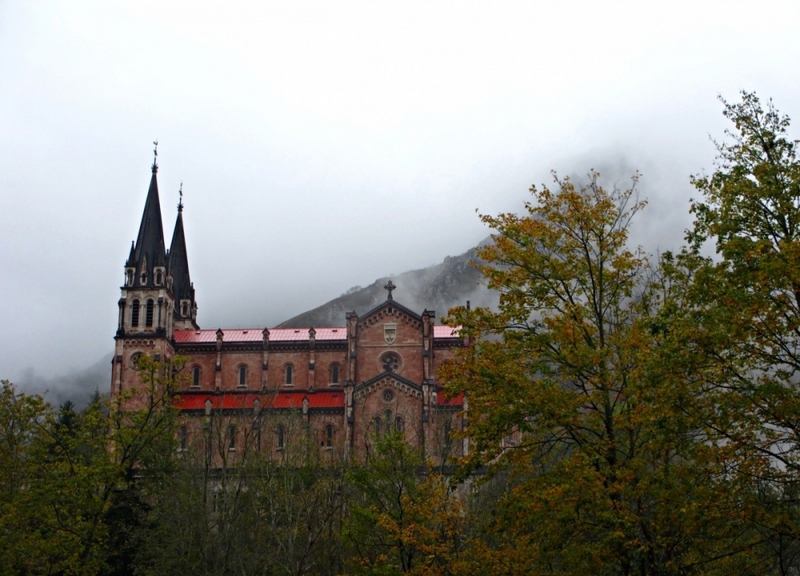 Unfortunately, it was so misty that we couldn’t go see the famous Lagos de Covadonga like we were supposed to. They said it was so misty that we wouldn’t have been able to see the lakes. I don’t think I’ve ever been turned away from a tourist attraction before because of the mist. Stunning! Misty/foggy conditions are just so hauntingly beautiful to me. You really captured the essence of this mountain town. Thanks! If you like mist, Asturias is a great place to be. Have you been? Nice! It’s a cool place, and really different from ‘typical’ Spain. Love the green and the mist. I gotta check it out sometime! Yeah you should definitely go – it’s really beautiful! My boyfriend’s family is from Asturias, and he took me for the first time in April of 2009. I will forever be pining for the hills, the cheese and the accent. I would give everything in Seville up to be a shepherd, te lo juro! Reminds me of the infamous fog of San Francisco, which is just as thick! It is similar! I’ve never seen San Francisco quite this foggy, but I bet it gets there. Pretty pictures! Asturias is a beautiful place. Thanks! It’s so beautiful, I’d love to see more of the countryside. 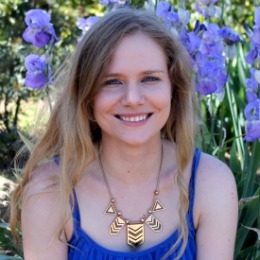 Loved your post, Jessica! 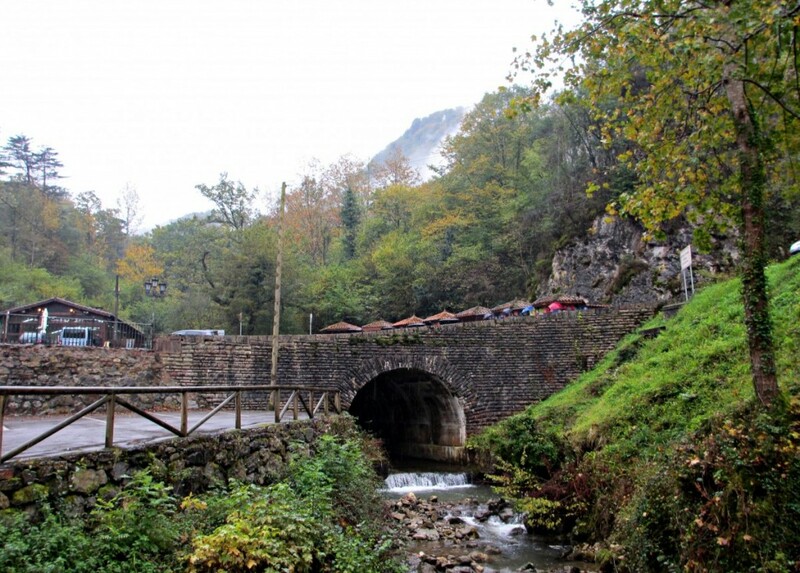 Asturias is really pretty and their weather can be a little crazy… Oh! 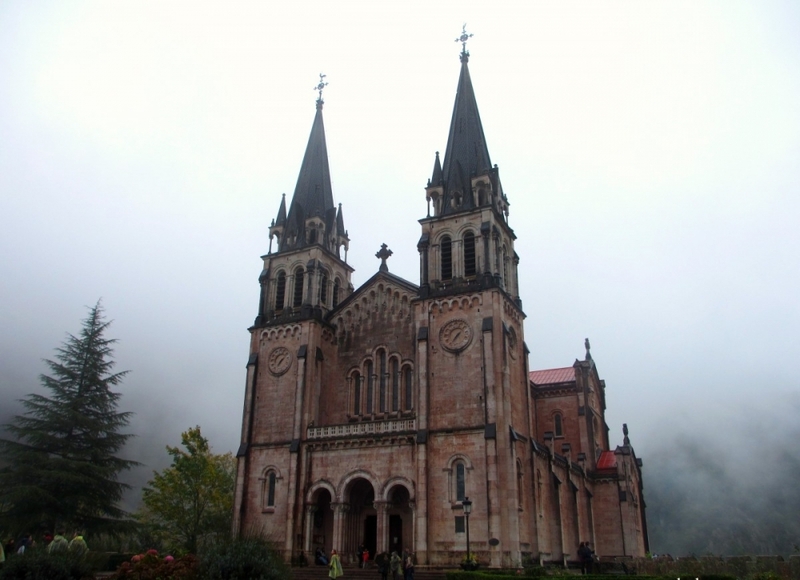 I do find the name “Covadonga” really weird and sounds funny to me… Did you know that it is quite popular in that part of Spain to name girls “Covadonga”? Glad you made it to Asturias. Nice photos. Saludos! Me too, it’s such a gorgeous place. Thanks for stopping by! When you say fog, all I think of, out of all my travels, is Austria and San Francisco. They have definitive fog association. Love the look of the church. Looks wicked awesome with the fog around. Agreed, two foggy and beautiful places!